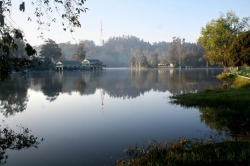 Enjoy a romantic walk round the Kodaikanal lake, go for a run on the jogging tracks. Rent cycles and explore the numerous woodland roads. Ride horses, go boating, enjoy all that the lovely countryside has to offer. Visit the local museum that showcases over 100 years of Kodaikanal history. Get an exposure to the local cottage crafts industry. Experience the different cuisines that Kodaikanal restaurants have to offer.